A Neal Porter Book (Roaring Brook Press), 2010. Three artists collaborated to make this exquisite nonfiction picture book about the collaboration of three other artists. 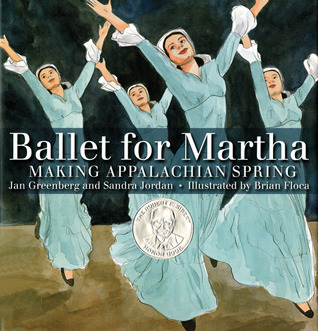 Greenberg, Jordan and Floca eloquently share the story of how Martha Graham, Aaron Copland and Isamu Noguchi worked together to create the iconic American ballet, Appalachian Spring, which debuted in 1944. The book would make an excellent read aloud and an introduction to the world of ballet for many young readers. The authors share how Graham had the idea for a ballet set on a Pennsylvania farm during pioneer times. Floca's watercolor illustrations depict Graham in graceful poses as she choreographs the ballet. Copland is seen working at his piano while manuscript paper serves as the background on the page. Artist, Noguchi, who lived in a Japanese internment camp during World War II, designed the set for the ballet. Greenberg and Jordan effectively weave quotations into the narrative, and a source note for each quote can be found in the back of the book along with a lengthy bibliography. An authors' note or "Curtain Call" provides readers with interesting background information about Graham, Copland and Noguchi. Readers who enjoy Ballet for Martha may want to check out Action Jackson by Greenberg and Jordan. 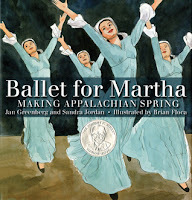 The Smithsonian provides educators with a Ballet for Martha lesson plan for K-4 classes. Be sure to share this YouTube video of Appalachian Spring. Did you know that Jan Greenberg, Sandra Jordan and Brian Floca have each won three Sibert Honors for best informational book for children? 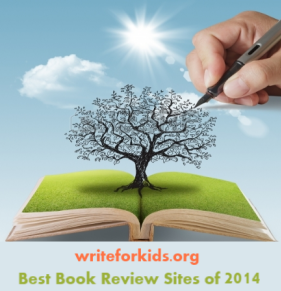 Take a look at our Sibert Medal infographic for more Sibert stats. This is one of those books that I've been meaning to read for ages--thanks for bringing it back up to the forefront for me. I also appreciate the links to the video clip and the Smithsonian lesson plans link. We ask students to work in cooperative groups so often these days; it's nice to be able to share with them a real-life example of adults working together to create something grander than they ever could have done on their own. I love things about Martha Graham. I can't wait to check out this book.